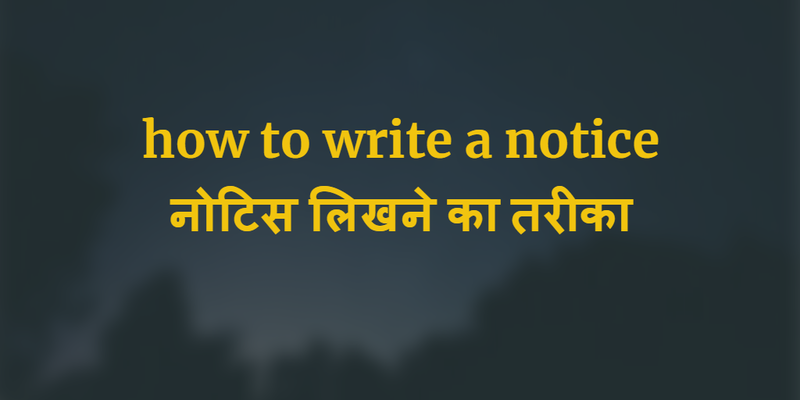 how to write a notice नोटिस लिखने का तरीका ~ Classin.xyz- The Ultimate Resource For Jharkhand Gk, Gk, Eduction ,eduction News, Mobile. A notice is a written or printed news announcement or information. A notice can be in the form of a formal announcement of public importance or it can be warning in advance or it can also be used for giving information to a section of people or people at large . Notices are given generally newspapers or magazines or displayed publicly on a school/college notice-board.A notice can also find a place in the columns of a newspaper as an advertisement. (i) Generally school notices are written on printed pads of the student' council/ Instituting Dramaor cultural club etc. Otherwise, the authority that is writing the notice writes its name just at the top. (ii) Notices are written in a very formal and simple language. (iii) Noices for school' and college ' notice- board contain certain announcements or information to student. They are brief and to the point , having on scope for irrelevant or superfluous material. (iv) The signatures of the issuing authority of the notice , for example, the principal/ president or secretary of the student ' council/ secretary of the Drama and cultural clab etc. are made at the bottom on the left-side. (v) The date is given eiven eithre at the top or at the bottom.